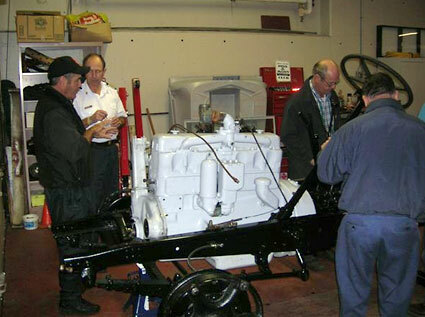 In the mid 1930s, the VFD purchased a Studebaker truck chassis with the purpose of converting it – the basic chassis, power train and cowl – to a pumper. Their intention was to acquire an additional piece of apparatus at less cost. It was normally VFD practice to contract a fire engine builder to build a custom rig but these were tough times and there was little money during the Depression, even for fire apparatus. The truck, equipped with a 110hp Waukesha engine—standard power for Studebaker trucks at the time – was turned over to Meston’s on Johnson St. That well- known Victoria company, built carriage and wagon bodies, and then made the transition from horse drawn vehicles to trucks. The Fire Department felt that they could make a small budget go even further if they used the body off another, earlier VFD rig that had been retired. Meston’s made what changes were necessary to make this body fit and conform to other VFD specifications and attached it to the Studebaker chassis. A 100 gpm pump, with controls, was attached. It’s quite possible that fire equipment came from other trucks: hard suction hose, booster reel, ladders, and other equipment such as warning lights and siren. The truck normally carried 200 feet of ¾ inch hose, 450 feet of 1 ½ inch hose and 1500 feet of 2 ½ inch hose. This load was supplied by the department. This apparatus protected James Bay during WWII from a converted house on the 400 block of Superior St. The shipyards and wartime housing in the district made a fire department presence in James Bay necessary. Until the war, fire responses, from 1918, were from downtown. The ‘Com’ as it became known, returned to No.1 Hall and responded to grass fires until it was struck off the roster in the late 1970s. It then served a fire department on Piers Island, until being donated to the British Columbia Transport Museum in the early 1980s. 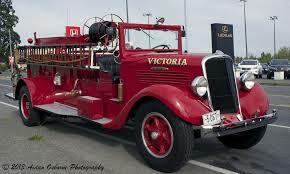 Upon the dissolution of that collection, the Studebaker was returned to the Victoria Fire Department for preservation. In 2005, the VFDHS started a major frame-off restoration. It was discovered at this time, that the body of the ‘Com’ may well have come from the 1914 Nott Universal Hose Wagon.